Happy Friday lovelies and a warm welcome to the much needed rain here at Chunky HQ. Last night I hosted my first cushion workshop at Meggies Lifestyle and Gifts in Stow-on-the-Wold. A fantastic group of 10 ladies came together all in the name of Chunky goodness. The colours selected were beautiful and the finished products looked lovely. My only regret is that we didn't get more photos of the finished products. Keep an eye out for more workshops coming into the Autumn/Winter months. 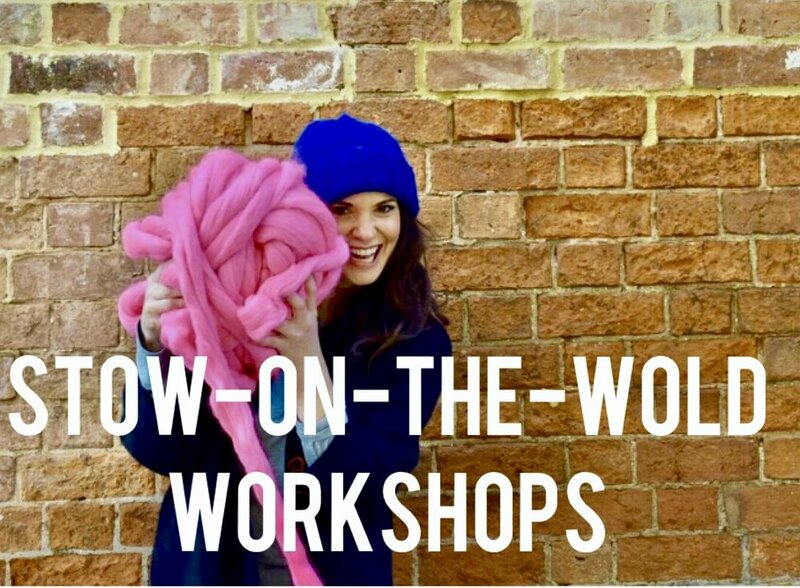 Attending these workshops is a great opportunity to not only learn a new skill, but coming up to Christmas these cushions make really thoughtful, original gifts for the friends in your life that seem to have it all. I'm going to dash for now but just wanted to share with you the great evening had last night. As a former classroom teacher, I loved getting back in front of students. I love teaching and sharing knowledge with others, it's really the greatest gift. Thank you Meggies and to all of you that attended last night. I loved every minute. The Chunky Needle has had a cracking few weeks, going from strength to strength. Our social media and website views this week hit a new record. I’m so grateful to all those that pop round and check out all things Chunky Needle. Your feedback and positivity is infectious and offers so much encouragement to develop and create new projects. My head is swelling with ideas and plans for the Autumn/Winter and I can’t wait to get back into Chunky HQ after our Cornwall holiday. Going back to the market I attended a couple of weeks ago, I was amazed at how many people asked me if I personally made all the products I was showcasing. It was an unexpected question. I assumed that others naturally saw me as the Maker behind the cushions and blankets I was selling. I’ve had time to think on this. People want to support individuals, artists and craftspeople. They want to meet the very person that puts their name and “stamp” on the final product. Those that buy local want to know where their contribution is going and want to make personal connections to that Maker. At The Chunky Needle I am the sole face behind the name and brand. I’m not a limited company employing staff and you can be assured that every Chunky Needle product you purchase has been carefully crafted by me. Me alone. I don’t have the financial overheads that other sellers may have to absorb into their pricing structure, namely: employees, premises, PR teams, managers etc. As a result my products are costed more affordably than those of my competitors. Luxury and quality are never sacrificed despite affordable pricing. I always use the best merino wool available to traders in the UK. Responsibly sourced from South Africa, the merino wool that goes into Chunky Needle homewares is of the highest grade available. I pride myself on the “details” so when you purchase a Chunky Needle product nothing goes without thought all the way down to presentation and posting. Care has gone into each package with each parcel being dropped off personally to the shipping depot 40 minutes away from the Chunky studio. It’s my personal commitment to you, the buyer. So as I reflect on the Chunky Needle’s growth since the website launch nearly 5 months ago, I’m so proud of what has been accomplished and the direction my small business is moving toward. The Chunky Needle is all me. No “helpers” or additional knitting staff. Just me, making it personally for you. Keep cool lovelies and enjoy the sun. PS: A few tickets remain for the cushion workshop at Meggie’s Stow-on-the-Wold on August 9th. Last day to secure your wool colour choice is July 31st so don’t delay. Follow the banner link on the homepage to secure your spot. Hello lovelies how are you all? I've been a bit off the radar as of late whilst I've been sweltering away in a very rare British summertime heatwave, buried alive under kilos of merino wool. 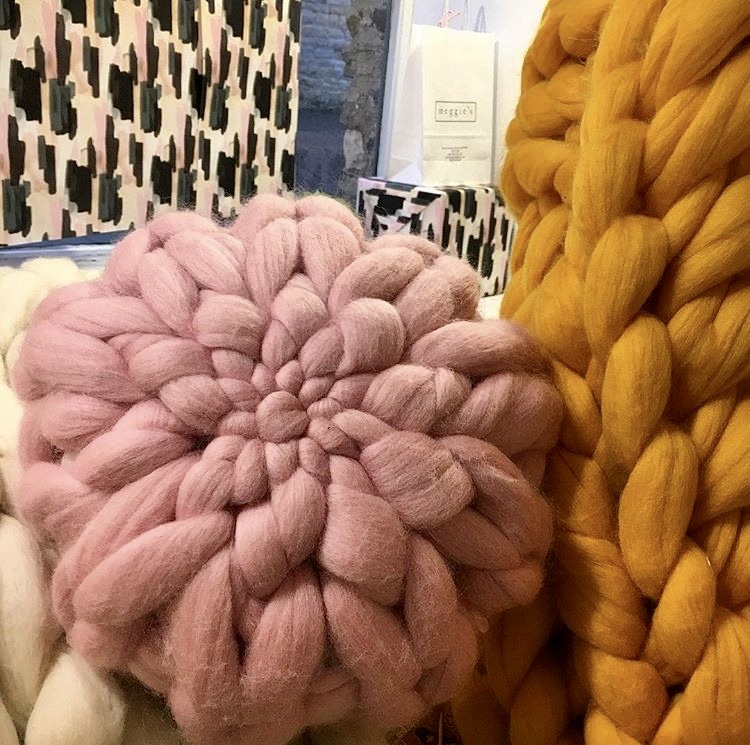 I must tell you that knitting up a superking blanket with 7kgs of wool in a studio that doesn't seem to get lower than 25 degrees has been quite an experience indeed. In any case, I've been beavering away over these hot days building up stock for my first market experience that was held yesterday in Cheltenham - but more on that later. It's been a really informative week for me in ways that delve way beyond my chunky needles and into the stratosphere that is 'running a business.' Last week I was treated by a fellow and local Maker to a "Preparing to Sell" seminar hosted by the fine folks at The Contemporary Craft Festival. The day saw four industry experts share their tried and tested knowledge to a room of lovely Makers. Not only did I have a great day meeting some very talented people, but the lectures on PR, Press Releases, Pricing Your Craft and Preparing for Market Selling were particularly beneficial as I was about to 'set up shop' for the first time outside the cyber world.. The timing couldn't have been better to help build my confidence. 1) Do not go to a drinks party the evening before without already having your car (ahem cars) fully loaded with your swag. 2) Do not go to bed the night before without loading your car(s) with swag. 3) Do not wake up Market Day with only 90min to spare and think you can get yourself, husband, kids fed, dressed with needs met and THEN load your car no matter how simple it seems to just put all those bags/boxes into the boot. 5) When setting up your stall in 30 degree weather (indoors!) perhaps have a quick change of clothes prior to opening or at a minimum bring deodorant or perfume to freshen yourself up, and if you 'glow' as much as I do, a cosmetic powder compact would be most useful. 6) Surround yourself with friends, peers and a dedicated husband to boost you up when you fall down. 7) Refer to number 1 . Just don't drink the night before period! Yes the day got off to a bit of a rocky start and I lost a bit of confidence but I have to tell you, the organisers of the Cotswold Market were just fabulous, as were my stall neighbours. The encouragement and support offered to me was incredible. When I arrived and saw the volume of my stock, size, weight, amount, etc. next to that single 6ft table, I just didn't know how it would physically work. But with the support of those behind me I was able to pull together something quite special in my opinion. "We loved your stall. Looking forward to choosing what to order!" Lisa D.
We had the super hot weather against us with footfall, but I can honestly say, over that 4 hour period, I didn't sit down once and never had more than 5 minutes wait between talking to another shopper. Everyone was quick to B-line over to the blankets and cushions to feel them and give them a good stroke. Everyone was gobsmacked when they saw my supersized custom made needles. I had amazing feedback and it really bolstered me. In the last hour I was able to sell 3 cushions. I was so excited to use my card reader for the first time. A big shout out to Sarah at Muddy Stilettos Gloucestershire for her support as well as my other buyers. So many cards were taken and everyone had a giggle at my marketing tag lines, "nothing comes between me and my Chunky" and "no one puts Chunky in the corner." I loved getting out there in the real world. I think I've got a market bug now! This week I've learnt that it's really important to support each others businesses and to encourage one another. I witnessed on Sunday the truth to this. I've spoken to so many women in business and have been so impressed by their ethic, vision and drive. It's been a real inspiration and the feedback I've received has been so very encouraging. In a country of 70 million and a planet of 7 billion, there is enough room for us all. Thanks for reading guys and my continued appreciation for your support, kindness and love. Sweaty and probably smelly but loving every minute. We are super excited to share the news that The Chunky Needle has been nominated in the Best Interiors Shop category in the annual Muddy Stiletto Awards Gloucestershire. What an honor to be nominated - seriously! Please take a moment and support us clicking on this LINK and nominate us further. By voting for us now it will hopefully see us get to the next round of competition. Thank you so much!